« Apple launched Macbook pro featuring Retina Display for Rs 1, 52,900!!! Airport Express for Apple updated!!!!! 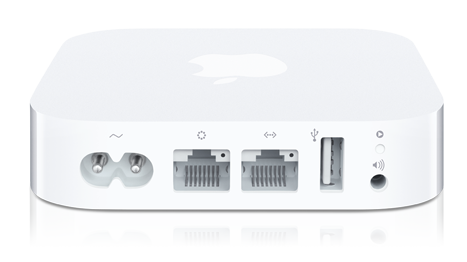 Apple quietly updated its hardware “Airport Express”. Despite of Apple’s various launches this was the most unexpected update. Also Apple has updated ios “Airport Utility” that support IPV6. Airport Express now supports “Airport Extreme” one feature i.e. dual band 802.1 and WiFi connection. You can now perform initial setup via ios device. Various updates include AirPlay & Wireless Printing. This device brings complete redesign hardware. Its exterior looks like Apple Tv rather than HDMI port. On its front you have status light which blinks in amber colors. There are ports at back: ethernet ports :one WAN & other for LAN , USB port, 3.5 mm audio mini jack for analog & optical digital sound & reset button. You have to plug-in your device into power outlet that makes ports clumpsy. But this design resolves by using old power cable. Like Apple laptops the Airport express is available from Apple Web Store for $99( as earlier). This entry was posted on 12/06/2012, 9:15 PM and is filed under Latest of APPLE. You can follow any responses to this entry through RSS 2.0. You can leave a response, or trackback from your own site.